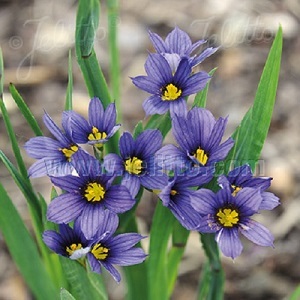 Blue-Eyed Grass is a very attractive flowering plant from North America. It grows grass-like leaves and violet blue star-shaped flowers in early summer, from May to June/July. Plants grow to a height of about 20cm and are ideal for rock gardens and edging, looking particularly good growing together in groups. The plants grow best in full sun to part shade and moist well-drained soil. Plants naturalise in the right conditions. Pack of 50 seeds. Sow anytime, typically spring to autumn. Sowing instructions and a colour photo are printed on the packet. Sow Sow in a tray of compost. Cover the seeds lightly with compost and keep at around 20°C and seedlings emerge in 2-4 weeks. If there is no germination within 4 weeks, then move the seed tray into a fridge for 2-4 weeks and back outside for germination. Pot on and grow until the plants are ready to plant out after the last frost. Or sow the seeds in an unheated greenhouse in autumn and seedlings emerge in the spring. Grow Cut back flowerstalks or untidy leaves after flowering. Plants are semi-evergreen and form rhizomes as they mature. Do not mulch plants too heavily. Mature plants can be divided every 2-3 years in spring.